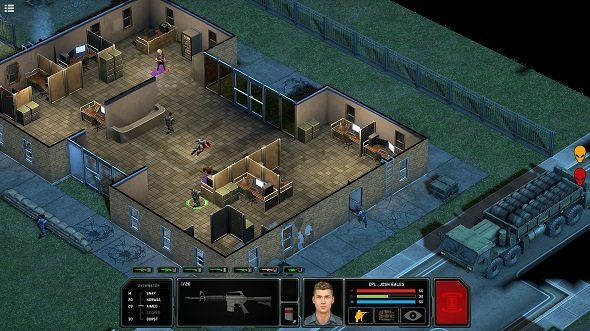 Xenonauts 2 has been in the works for quite a while now, but developers Goldhawk Interactive decided to launch a Kickstarter campaign last month to raise funds for the finishing touches on the sequel to their spin on the classic X-Com titles of the ‘90s. That effort was successful, and they’ve wrapped up their crowdfunding project with nearly 400% of their target backing. London-based developers Goldhawk Interactive set a goal of £50,000 for the Xenonauts 2 Kickstarter, asking potential backers for help with the final push on development – finalizing the feature set and polishing the game. Friday, the Kickstarter came to a close after bringing in a grand total of £191,107. If Xenonauts 2 looks interesting, you might like to check out our list of the great strategy games for PC. That amount was enough to unlock five stretch goals the studio set out as incentives, including modular weapons, Geoscape ‘Situations’, locational injuries, a MARS weapon platform and sentry guns, and an additional community edition and modding support. The community edition and modding support had been set as a £200,000 stretch goal, but when the campaign wrapped up, Goldhawk wrote in an update on Kickstarter, the team wanted to show their gratitude by unlocking the next goal as well. Xenonauts can be thought of as kind of an alternate timeline version of the X-Com reboots, XCOM: Enemy Unknown and XCOM 2. As in the classic ‘90s games, Xenonauts had players building multiple military bases around the world, and managing tactical situations on the ground in a more sprite-style isometric battlespace. The sequel promises to expand on the strategic and tactical options available to players, and provide remarkably granular control over the alien interdiction effort at all levels, with the ability to manage employees from foot soldiers to command staff. GOG.com has hosted a free Xenonauts 2 demo for a while now, and you can also download it direct from Goldhawk. Xenonauts 2 is scheduled for release November 1st.